The Hyundai i20 is the latest hatchback to undergo the crossover treatment giving us the i20 Active. 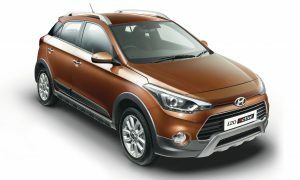 It is more than just a standard i20 with elaborate SUV make up on as Hyundai has fiddled around with the mechanicals increasing ride height and improving performance slightly. Having said that, it still hasn’t been thoroughly re-engineered to tackle off-road conditions, but will not bother most buyers as the car will mostly be used in the urban environment tackling that occasional bad patch of road. 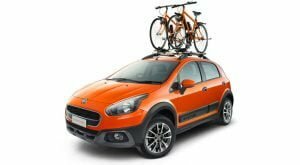 The Fiat Avventura is currently the best crossover on sale right as we found out in this comparison here, but is the new Hyundai i20 Active better? Can it dethrone the Fiat or is it just another overpriced cosmetic upgrade? We find out. 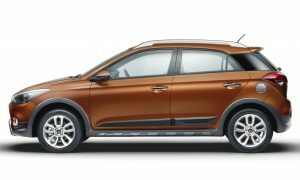 The standard i20 hatchback is a very good looking car and Hyundai has taken that increased the height by a few inches and added a few bits all around the car to give it the crossover look. There’s black plastic cladding all around highlighted by faux scuff plates finished in silver at the bottom of the front and rear bumpers. 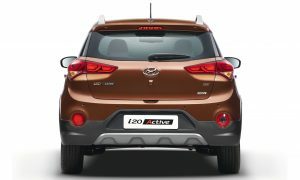 The i20 Active features an inverted version of the large honeycomb grille seen on the Elite i20 now with horizontal slats and new round fog lamps. The headlamps, much like the Euro-spec i20, get projector units with LED daytime running lights while the tail lamps have been carried over unaltered. Other additions include new alloy wheels, roof rails and round reflectors at the rear. Moving on the inside the most noticeable change is the use of all black with orange highlights or a blue-black combination, depending on the exterior paint shade, instead of the usual black-beige combination. The seat upholstery has been similarly done lending the cabin a much more sporty feel. Everything else remains unchanged and you get the same comfortable and spacious cabin as the i20 hatchback. Fiat has done some serious work on the Punto Evo to turn it into the Avventura crossover. 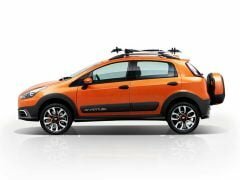 Apart from the usual plastic cladding all around and faux skid plates at the front and back, Fiat has also added a rear mounted spare wheel which is probably THE defining SUV-like characteristic of the Avventura. The ride height has been increased to 205mm and the size of the wheel arches has been increased to accommodate the bigger, chunkier tyres and 16 inch rims. The roof rails don’t just serve to increase the aesthetic appeal as they have been cast out of aluminium which helps in keeping the weight at the top in check in order the keep the centre of gravity as low as possible. On the inside, the black-beige combo of the Punto Evo’s cabin has been ditched in favour of a much more sporty black-grey combo. The grey bit finished in an alcantara like material feels especially nice to touch and adds to the quality feel inside. Fiat has also added a compass and read outs for tilt and pitch on top of the A/C vents adding to the SUV feel inside as well. The cabin is not as spacious as the i20 Active’s but it is still reasonably comfortable and does the job well. 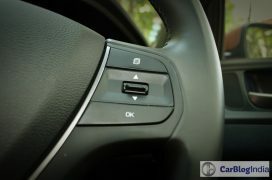 The Hyundai i20 Active is clearly the more feature rich of the two as it gets some unique kit such as keyless entry, engine start/stop button, cooled glovebox, rear parking sensors with camera, projector headlamps and daytime running lights. The Fiat Avventura gets most of the essential features and while the Blue&Me software by Microsoft supports phone functions, it does not enable bluetooth audio streaming. Unique features on the Avventura include a compass, tilt and pitch readouts, LED tail lamps and ambient lighting near above the glovebox on the dashboard. While the Hyundai i20 Active offers a comfortable ride absorbing potholes and bumps with ease, the driving experience is marred by the light steering, a problem plaguing most Hyundais. Also, the increased height results in added body roll, but it isn’t very noticeable. 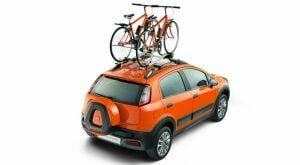 The Fiat Avventura has better ride and handling of the lot. Body roll due to the increased ride height has been kept in check with the help of an anti-roll bar added to the rear suspension and the hydraulic steering offers decent feedback. The car does a decent job off-road as well, but the lack of a four wheel drive system means that it struggles in slushy, slippery mud. The Fiat Avventura produces marginally higher power than the Hyundai i20 Active, but it returns a slightly low fuel economy than the latter. The i20 Active diesel variant gets a 6-speed manual transmission option while the Avventura gets a 5-speed. The 1.3 litre Multijet suffers from turbo lag below 2,000 rpm, but apart from that does a decent job. The i20 Active’s 1.4 litre CRDi motor is better to drive especially combined with the 6-speed manual. Both cars are available in two trims for the petrol version and three trims for the diesel version. While the petrol Fiat Avventura is slightly more expensive than the Hyundai i20 Active, the diesel version is cheaper by around INR 40,000. The extra money does get you additional kit, but the cheaper Avventura is a better engineered crossover. The recently launched Hyundai i20 Active and the Fiat Avventura, both make a very strong case for themselves making it hard to pick a winner. The Hyundai is more spacious, packs more features and has a slightly better engine, while the Fiat is a more serious crossover, looks better, handles better and is cheaper and capable enough to take the fight to compact SUVs like the Ford Ecosport. So what do you have to say about our Hyundai i20 Active vs Fiat Avventura spec-sheet comparo? Do let us know by commenting below.